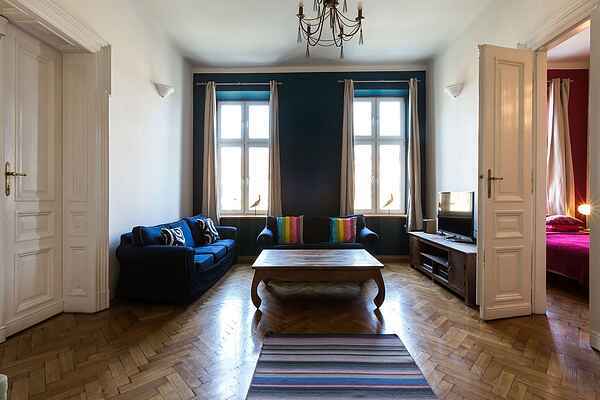 Great large apartment located in the enchanting city of Krakow. It is a perfect place if you are coming with a group of friends or with a large family - or if you are just a few people, no doubt that you will appreciate all the space available here! The apartment is conveniently situated in the heart of the Jewish Quarter and just 5 minutes walk to the Main Square. It is located on the second floor of a charming ‘Arts and Crafts’ period building, built in 1893. It has been modernised throughout to ensure complete comfort for guests, whilst care has also been taken to retain as many of the elegant original features as possible.